Finally, I can tick this off my list of things to finish. I am so pleased, as it has been in progress for years. literally. Let me tell you about it. About 4 years ago (!! yes I know) I went on a lovely day course at a nearby art centre. It was Fathers day, a good excuse, I thought, to leave my husband with his baby daughter for some father-daughter bonding! So off I trotted, and I began this. It is a rag rug, but designed as a wall hanging rather than a rug (don't you dare put your feet on it). 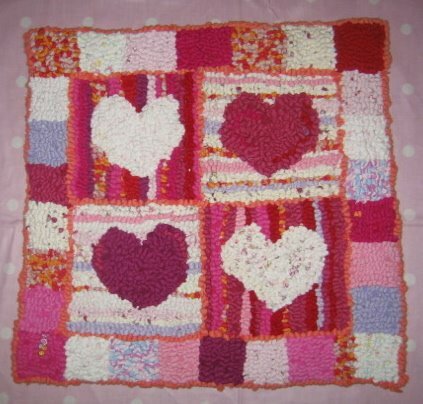 It is made out of all my daughters smallest babygrows, explaining the mix of pinks and whites and reds. I am quite pleased with it, and despite the rather wonky hearts it feels lovely and nobbly to the touch, and is warm and soft and full of memories. I promised the tutor I would send a photo when I finished, but I can't even remember her name now. I am not sure how I will display it, I will have to do some research, whether I can put a baton on the back, or whether I should frame it, I don't know. So now I can get on with some new projects. I want to make spring things, easter things, but we have had snow again today, and it is hard to get in the mood when the trees have snow on them and no sign of blossom. We watched Madagasgar this afternon with the children on rented dvd, it was quite amusing in parts, I liked the penguins best. I started sewing a little doll, we shall see how she turns out in the next few days, she is a quicky while the snow gets over and done. Wow, that is GORGEOUS! The mixtures of colors is so yummy! Hannah , I love the rug, congrats on finishing it. I would love to rag rugging. Hannah , I love the rug, congrats on finishing it. I would love to try rag rugging. It is so lovely! I've always wanted to try this and the fact that you used your daughter's clothes makes it so special. Love the pinks and reds!